We assessed disparities in viral suppression (VS) and antiretroviral therapy (ART) adherence among women of the HIV Outpatient Study to inform HIV treatment strategies. We used adjusted prevalence ratios (aPR) with 95% confidence intervals (CI) to assess VS by race/ethnicity and generalized estimating equations to investigate factors associated with not achieving VS and ART non-adherence. Among 426 women (median age = 46 years), at baseline, VS was less prevalent among black women (63%) compared with Hispanic women/Latinas (73%) and white women (78%). In the multivariable analysis, factors significantly associated with not achieving VS included the following social and behavioral determinants of care: using public insurance (aPR = 1.69, CI 1.01–2.82, p = 0.044) compared to using private insurance, seeking care in a public clinic (aPR = 1.60, CI 1.03–2.50, p = 0.037) compared to seeking care in a private clinic, and ART non-adherence (aPR = 2.79, CI 1.81–4.29), p < 0.001). Although race was not a significant factor in not achieving VS, race was associated with ART non-adherence; black women were more likely to miss a dose of ART medication (aPR = 2.07, CI 1.19–3.60, p = 0.010) when compared to white women and Hispanic women/Latinas. Interventions and resources disseminated to address social barriers to care and improve VS and ART adherence among HIV-positive women, particularly black women, are warranted. The authors contributed equally to this work, based on the following criteria: (1) substantial contributions to the conception or design of the work (A.G and M.S), (2) the acquisition, analysis, or interpretation of data for the work (A.G., M.S. and C.A. ), (3) drafting the work or revising it critically for important intellectual content (A.G., M.S. C.A., and K.B), (4) final approval of the version to be published (A.G., M.S. C.A., and K.B), and (5) agreement to be accountable for all aspects of the work in ensuring that questions related to the accuracy or integrity of any part of the work are appropriately investigated and resolved (A.G., M.S. C.A., and K.B). We also wish to acknowledge the contributions of the HOPS patients, as well as the HOPS Investigators: Kate Buchacz, Marcus D. Durham, Division of HIV/AIDS Prevention, National Center for HIV, Viral Hepatitis, STD, and TB Prevention, CDC, Atlanta, GA; Harlen Hays, Rachel Hart, Thilakavathy Subramanian, Carl Armon, Stacey Purinton, Dana Franklin, Cheryl Akridge, Nabil Rayeed, Linda Battalora Cerner Corporation, Kansas City, MO; Frank J. Palella, Saira Jahangir, Conor Daniel Flaherty, Patricia Bustamante, Feinberg School of Medicine, Northwestern University, Chicago, IL; John Hammer, Kenneth S. Greenberg, Barbara Widick, Rosa Franklin, Rose Medical Center, Denver, CO; Bienvenido G. Yangco, Kalliope Chagaris, Infectious Disease Research Institute, Tampa, FL; Douglas J. Ward, Troy Thomas, Cheryl Stewart, Dupont Circle Physicians Group, Washington, DC; Jack Fuhrer, Linda Ording-Bauer, Rita Kelly, Jane Esteves, State University of New York (SUNY), Stony Brook, NY; Ellen M. Tedaldi, Ramona A. Christian, Faye Ruley, Dania Beadle, Princess Davenport, Lewis Katz School of Medicine at Temple University, Philadelphia, PA; Richard M. Novak, Andrea Wendrow, University of Illinois at Chicago, Chicago, IL; Benjamin Young, Mia Scott, Barbara Widick, Billie Thomas, APEX Family Medicine, Denver, CO. The authors have no financial conflicts to report. This work was supported by the CDC (Contract Numbers 200-2001-00133, 200-2006-18797 and 200-2011-41872). Centers for Disease Control and Prevention. HIV Surveillance Report, 2017; vol. 29. http://www.cdc.gov/hiv/library/reports/hiv-surveillance.html. Published November 2018. Accessed 19 Dec 2018. Centers for Disease Control and Prevention. HIV Surveillance—Epidemiology of HIV Infection (through 2017). https://www.cdc.gov/hiv/library/slideSets/index.html. Accessed 19 Dec 2018. Centers for Disease Control and Prevention. HIV surveillance in women, 2017. http://www.cdc.gov/hiv/library/slideSets/index.html. Accessed 19 Dec 2018. Office of National AIDS Policy. National HIV/AIDS Strategy for the United States: Updated to 2020. Washington, DC: Office of National AIDS Policy. https://www.hiv.gov/federal-response/national-hiv-aids-strategy/nhas-update. Accessed 2 Apr 2018. Centers for Disease Control and Prevention. 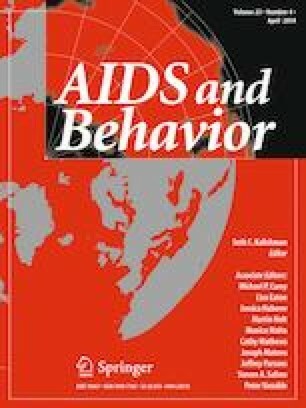 Social determinants of health and selected HIV care outcomes among adults with diagnosed HIV infection in 32 states and the District of Columbia, 2014. HIV Surveillance Supplemental Report 2016;21(No. 7). http://www.cdc.gov/hiv/library/reports/hiv-surveillance.html. Published December 2016. Accessed 1 Nov 2018. Centers for Disease Control and Prevention. Behavioral and clinical characteristics of persons receiving medical care for HIV infection—Medical Monitoring Project, United States, 2014 Cycle (June 2014–May 2015). HIV Surveillance Special Report 17. http://www.cdc.gov/hiv/library/reports/hiv-surveillance.html. Accessed 28 Mar 2018.